Ray-Bar Engineering Corporation is a major provider/manufacturer of x-ray and radiation protective lead glass shielding products worldwide, and has been for over 70 years. 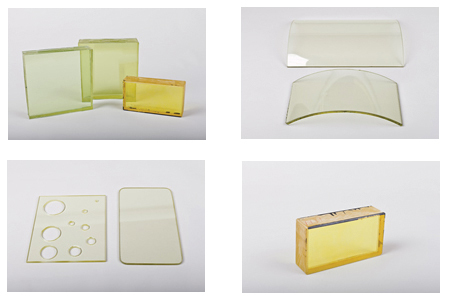 Specialty Ray-Bar x-ray and radiation protective lead glass is utilized when a clear view and radiation shielding is of absolute priority in diagnostic, therapy, isotopic, or nuclear radiation sources. It is used for radiation shielding in medical treatment, imaging, testing, inspection, experimentation or energy production. Ray-Bar's Standard X-Ray Protective Lead Glass is typically utilized in medical diagnostic imaging control windows for applications of 150kvp x-ray gamma radiation energies or less such as in radiology, fluoroscopy, angiography, cardiac catheterization labs, computerized tomography (CT scan),chiropractic x-ray and mammography rooms. X-ray lead glass is not for use in MRI applications. Ray-Bar also offers higher shielding equivalency x-ray protective lead glass for utilization in high energy gamma radiation shielding applications of 511kvp such as imaging control windows for Positron Emission Tomography Rooms (PET Scanners) or in Medical Radiation Therapy/Oncology Cancer Treatment facility rooms such as Gamma Knife, Simulator rooms, Brachytherapy, Dose Calibration, Hot Labs, or High Dose Radiation (HDR Rooms). Ray-Bar also offers specialized lead windows for industrial applications in non-destructive testing (NDT Rooms) or for certain nuclear or high energy isotopic shielding of hot cells or glove boxes. All radiation shielding requirements for x-ray lead glass control windows in any medical or industrial application or use must always be determined by the customer’s or end user’s qualified health radiation physicist, radiation expert or radiation safety professional as currently defined by NCRP, ICRP or CRPA. Ray-Bar’s 5/16" x-ray protective lead glass meets Federal Specification DD-G-451 and ASTM C1036 requirements and all applicable current NCRP and ICRP lead glass criteria and standards in physical quality descriptions. Ray-Bar X-Ray Protective Lead Glass also meets or exceeds National Council of Radiation Protection (NCRP) Report No. 49 and No.147, and also ICRP lead glass criteria and standards in physical quality descriptions and required densities. Ray-Bar X-Ray Lead Glass also meets or exceeds over 16 various national and international radiation glazing safety codes and standards of U.S.A., Canada, Britain, France, Japan, Germany, Austria and Russia. *Specific codes and standards are available upon customer’s request. Ray-Bar's X-Ray Glass has passed extensive radiation testing. It has demonstrated consistent radiation attenuation properties from a variety of isotopic and cathode tube x-ray or gamma sources ranging in output energy emission exposures of 80keV, 110, 150, 200, 250, 300, 350, 400, and now also 511keV for PET F-18 sources. Ray-Bar X-Ray Lead Glass has also passed cathode tube x-ray gamma radiation emission testing at the higher energies of 550, 600, 650, 750 and 1,000 keV and also with the following radioactive Isotopes: C-11, N-13, O-15, F-18, NA-22, CO-58, CO-60, GA-68, FE-59, RB-82, MO-99, TC-99M, I-131, CS-137 AND IR-192. This establishes known and reliable radiation attenuation coefficients for lead shielding equivalencies. Ray-Bar is also a proud member of the U.S. Green Building Council and the Canada Green Building Council and can assist in documenting and submitting Ray-Bar's various lead glass radiation shielding products for your hospital or medical center's LEED materials and resources (MR credits) to apply for achieving LEED certification for the project. Available in 1.8mm, 2.0mm, 2.4mm, 3.2mm and 3.7mm lead shielding equivalences. Higher ratings are available upon request. Uniformly dense and is a composition of high quality materials providing a dependable shielding value. Utilized for medical x-ray, gamma, alpha and beta photon shielding only. Not for thermal neutron or fast neutron shielding. X-ray lead glass will NOT shield against Magnetic Resonance Imaging (MRI), electro-magnetism or radio-frequency, ultrasound, laser or any non-ionizing types of radiation. Ray-Bar’s x-ray lead glass is specifically formulated to efficiently attenuate and shield x-ray gamma radiation. We utilize a unique combination of a heavy density blend and proprietary high content composition of heavy oxides and minerals. This provides maximum radiation shielding performance while minimizing glass thickness. The glass maintains excellent clarity and a non-browning optimal level of light transmission. Our lead glass provides code compliant radiation life and safety protection for the medical technician while also allowing a clear view of the patient during critical medical diagnostic imaging procedures. When compared to other acrylic based glazing options or thick plate glass types, just 5/16" thick standard Ray-Bar lead windows provide better than 1.6mm lead equivalency. This outperforms up to 4" of dark green heavy plate glass or up to 2" of dark honey color lead acrylic, both of which would filter visible light down to very low transmissions.